Craig, Rory & Chris on the Tay during training. Congratulations to Craig, Chris and Rory who recently completed their Power Boat Level 2 RYA qualifications with with the help of a grant from Glaxo in Montrose. 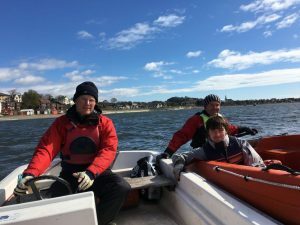 It was a two day course run by Monikie Country Park with the first day on the reservoir and the second day on the Tay. The conditions were a little challenging on the second day with wind and tide battling against an outboard only firing on one cylinder. Good practice!